The other night, I was channel-hopping when the clarity and lighting of the Pinoy movie showing on Cinema One caught my attention. Used as I had been to local films that were poorly-lit and with scratches showing on the screen – not to mention spoken language na hindi sabay sa galaw ng labî – I just do the sensible and stay away from them. There has to be a very special reason for me to watch a Pinoy film. Apart from the fairly obvious technical shortcomings of old, local films rather tended to squeeze every drop from a dramatic moment. One can only take so much sampalan and sigawan in an hour and a half of watching. Of the Pinoy films I have seen within the last five years, the one I really felt was worth the watch was “Anak.” The storyline was relevant and believable; and if the supporting cast could not quite rise to the quality of the lead, it was, at least, undeniable that Ate Vi's performance was simply exemplary. I do not know how she does it, but Ate Vi has this ability to totally immerse herself into a role so that her performances are so utterly believable, so completely natural. When Ate Vi acts out a role, she becomes the quintessential example of this thing called under-acting. To put it another way, acting without really acting... This is what is generally seen in Western cinema, as opposed to the nanlilisik-mata style almost expected of Oriental actors. In a manner of speaking, this style is even overacting. To be fair, the technique seems to be the one likewise preferred by audiences in China, Korea and Japan. Watch the cable channels broadcasting from these countries to see what I mean. I have only ever seen one or two Nora Aunor films, but in both these, she seemed excellent at the lisik-mata technique. 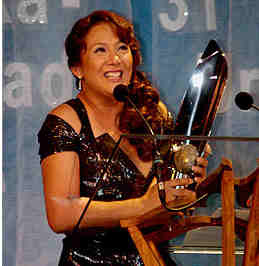 I think Ate Guy’s large expressive eyes were what set her apart as far as fans and critics were concerned. Forgive me if you are a fan; to me they looked a tad contrived. Opposite to this, there are those who act out roles as though they are in real life. 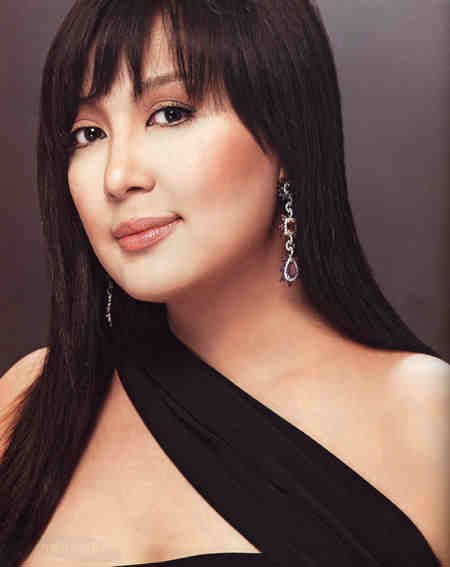 Aside from Ate Vi, Cherry Pie Picache is the other actress who, I feel, excels at under-acting a role. Back to “Caregiver,” I only caught the latter part of it. I did enjoy what I saw. The story was believable; the editing made for a fast pace; and I felt many of its technical facets put it at par with many Western-made movies. 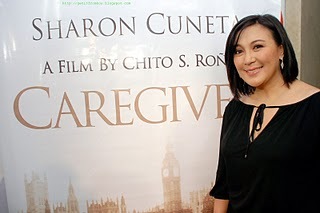 As for Sharon’s performance, there were moments when she was suave and completely natural, almost at par with the under-acting best I have seen from Ate Vi and Picache. But there were also moments in the same film when I felt she overdid things – such as when the grumpy Mr. Morgan hurled away his tray of food. I understand the emotion she was trying to convey; it just came across as artificial. Her inconsistency at times was a bit of a disappointment; albeit, that did not detract from the overall believability of her performance or the enjoyment I derived from watching what was left of the film. I used to avoid Pinoy films for the shallow storylines, the dragging scenes and the overall lack of technical quality. It's good to know that, at least, some films have outgrown the sigawan-sampalan genre which, if I’m being honest, I used to find a total bore. Sa totoo lang, I enjoyed the Dolphy &amp; Panchito, Pugo &amp; Tugo and Nida Blanca-era movies more.